While Matthews has sought to emphasize her prior background as a local TV news reporter and anchor, her tenure at Marriott over the past decade has given her a base of business backing that Trone could cut into. And Trone’s ability to self-fund a campaign could neutralize Matthews’ large campaign warchest, accumulated since last summer thanks to her network of contacts and those of her husband, MSNBC talk show host Chris Matthews. Lou Peck and Bill Turque are both great reporters, but I disagree with the opinions of their sources. If Trone gets in, it could actually help Matthews win the race. Here’s why. 1. The business community has money, but they don’t have a lot of loyal voters – especially in Montgomery County Democratic primaries. My hunch is that Matthews already has raised enough money to put on a competitive campaign. We will find out in a few days when the end-of-year finance reports come in. And her nationwide Democratic fundraising network, bolstered by her famous and well-connected husband, goes far outside the business community. As for Trone, he doesn’t need to compete with Matthews for money because he can self-finance. Cheryl Kagan, 2014: Kagan, a former Delegate, was significantly outspent by incumbent Delegate Lou Simmons in the open seat primary for the District 17 Senate seat. Kagan won by ten points. Ariana Kelly, 2010: Kelly was the only female challenger in a jam-packed primary for an open District 16 Delegate seat. Fellow challenger Kyle Lierman spent almost twice as much as Kelly, but she picked up the Apple Ballot and won a tight contest. Ariana Kelly, 2014: Challengers Marc Korman and Hrant Jamgochian each spent significantly more than Kelly as they battled it out for an open seat. Kelly was the only woman who ran a viable campaign and she finished first in the primary by nearly a thousand votes. Sheila Hixson, 2014: The long-time incumbent faced a scrum of challengers for two open Delegate seats, one of whom self-financed over $400,000. But Hixson, the only female candidate, smoked everyone and had a margin of more than 2,000 votes over the second-place finisher. Nancy Floreen, 2010 and 2014: In 2010, Floreen competed with two other top-tier female candidates, fellow incumbent Duchy Trachtenberg and Becky Wagner, and finished third in the council at-large primary. In 2014, Floreen was the only female at-large incumbent and had just one viable female challenger, Beth Daly. This time Floreen finished second, her best result ever. 3. Women are majorities of Democratic voters, no matter how you slice the data. Below are extracts from Montgomery County’s voter registration file as of January 2015. 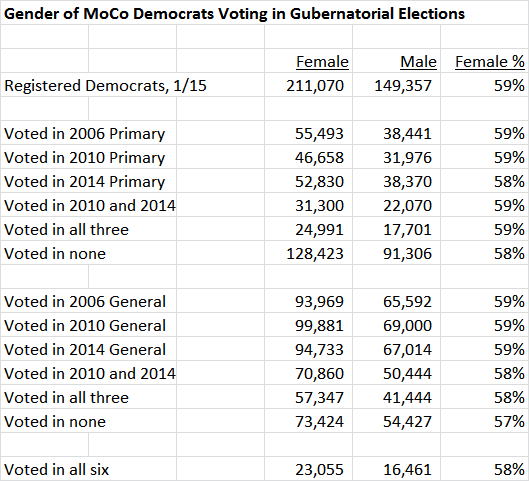 First, let’s look at MoCo Democratic voters in gubernatorial elections. 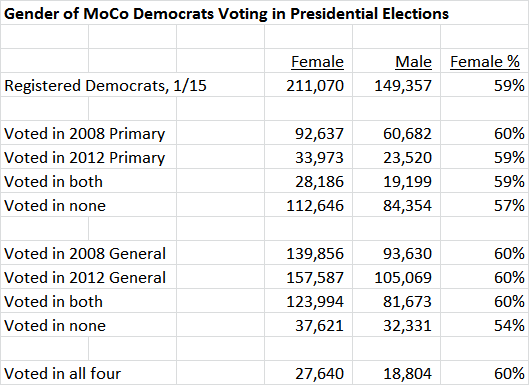 Next, let’s look at MoCo Democratic voters in presidential elections. Women are majorities in every single category of MoCo Democrats. When just one woman is running a competitive campaign against two or three competitive men, that matters. It also matters that Hillary Clinton is on the ballot and the possible departure of Donna Edwards from Congress could create an all-male federal delegation from Maryland.